Stacy Horn » Blog Archive » Okay, Which One of You Gave Me the Cold? Okay, Which One of You Gave Me the Cold? This is what I get for leaving the house. I have a cold. And the gas is still turned off (leak not fixed) so I can’t cook. Although it’s more accurate to say I can’t “heat” since I don’t actually cook anything, just heat stuff up. I took this picture of the train sign at Penn Station on Christmas morning. 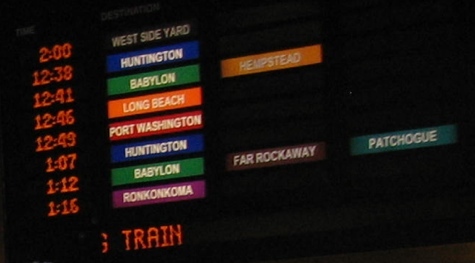 By the way, I love saying the town “Ronkonkoma.” Ron-KON-ko-ma. Aside from the cold which one of you gave me, thank you very much, I’m feeling pretty good. Starting to get feedback from the parapsychologists on the book, and corrections are coming in, but nothing major. (They might call them major mistakes, but if I can fix them in a couple of seconds to me they’re not major. I’m thinking purely in terms of time.) And aside from the mistakes, they seem to like it. Love it, they say! Cannot wait to send this draft to my publisher, but I have a few things left to do. Meanwhile, so not feeling well. I wish I had a bunch of good food in the house so I could just curl up on the couch. I guess I should order in, but unlike the rest of New York, I do not like to order in. I’m uncomfortable with having people hand deliver my food. See now if you lived on LI I would bring you Chicken Soup and I thought you gave us the cold. Feel Better!!!! Ha! It’s the thought that counts. But you guys came down with colds, too? I blame LIRR.